I want you to recall the penultimate interview scene of the film ‘3 Idiots’? Remember how incredibly the protagonist cracks the interview with his fearless attitude & soul-stirring honesty despite his consistently declining grades. Branding it as suspension of disbelief in the name of cinematic liberty might be an obvious old-school standpoint. For others like me and hopefully you, there is a more rational alternative reasoning to it. Mull it over or read further! Ask any old-hand MBA about the importance of grades. He’ll most likely advise that once you are out in the real world, its not so much as your GPA that counts as your white-collar disposition and business acumen. I am not trying to suggest that you should skip classes or that your degree is vain. In fact, I advise you do the exact opposite. Confused? Let me paraphrase. A typical MBA curriculum comprises presentations, assignments, quizzes, tests etc. And all these fetch you grades. But there are other more important things like industry clubs, student associations, networking etc. They don’t directly contribute to grades but will surely enhance your people-skills, which are undoubtedly vital post-MBA. A professor once told me that a B-School education is as much about what happens outside the classroom as inside it. You have to manage the trade-off between these inside and outside activities. Inevitably, your grades will suffer. I know intentionally sacrificing grades is not an easy habit to break. Especially for academic high achievers. But you have to look at the bigger picture. Temporarily, neglect all old-school opinions of your well-wishers. I reiterate that not studying is not what I mean by the above statement. On the contrary, study hard. Be thoroughly involved. Vigorously interact with you batch-mates. Bounce off questions to the professors. Challenge pre-conceived theoretical notions. Try to gain a practical understanding of the subjects to avoid the highly unproductive last-minute cramming sessions. I’ll give you an interesting example. When I was in 10th grade, I distinctly remember a class-mate who asked a peculiar question to our science teacher. “How can anything be burned without the presence of oxygen?”, he queried. It was a recurrent statement in the science text-book. The entire class including me was flabbergasted by the astounding simplicity of the question. Even the teacher took her own sweet time to gather her senses. During the two years in a B-School, you’ll literally be coerced to deploy lateral thinking and think unconventionally from a fresh perspective. I am re-educating you with these worldly-wise philosophies for a damn good reason. Professional and even scholastic success is a function of several factors and your grade is just a single data-point. Unless you score exceptionally high or abysmally low, your CGPA will just be an arbitrary number post-MBA. And even if you are a Five-Point-Someone (please disregard any correlation with Chetan Bhagat), be honest and own up to the grades during your placement interview. Never forget that your prospective employer wants to hire intellectually curious, well-rounded people who culturally fit within the organization. As a matter of fact, it’s been proved at a multi-national B-School called INSEAD that there is a negative correlation between high grades and high salaries. Need I say more? I recall an unintentionally funny incident concerning one of my MBA batchmates. Unlike me, he was quite good with textbooks and grades. However he struggled a lot while getting a job. If I remember correctly, he was finally selected by some company in his (hold your breath…..) “21st interview” (I suppose they have set a threshold limit now). He got it at a substandard CTC. My friend’s experience compelled me (and hopefully him) to juxtapose two scenarios: (a) A bookworm topper who slogs for 2 years to get good grades and (b) A well-rounded average-scoring student who gives a crack-shot at the final interview and secures a hefty package. Which one would you chose? Bill Gates once said “I studied everything but never topped….but today the toppers of the best Universities are my employees.” It implies that a stellar student may be a mediocre employee and vice versa. So learn enough in a B-School to make you ‘savvy’. But not a ‘nerd’. Anyway, as a manager or entrepreneur you can always hire lots of nerds (with good grades) to do specific tasks for you. Just don’t fall into that trap yourself. I am aware that its very convenient to preach while sitting at home. Genuinely following an eccentric advice is the hard part. It requires both trust and courage on the part of the reader. Just contemplate whether cramming the four P’s of Marketing or flawlessly drawing the BCG Growth-Share Matrix would necessarily benefit you in the corporate world. Unfortunately, things don’t happen in the marketplace the way they do in the textbooks. Because the real world will often surprise you by throwing new variables at you. Be prepared to tackle the disturbances created on your pre-existing theoretical notions. In order to achieve that, first you would have to overcome the orthodox and outdated Socratic way of critical thinking/learning. Discover and adopt more modern ways of assimilating useful knowledge. Grades are overrated, bigtime! So don’t give too much importance to them. Moreover an MBA student is graded in two phases: (a) Classroom projects, where you are judged on your assignments, presentations, quizzes & soft-skills and (b) Semester Exams where you have to score in traditionally structured written exams. Its noteworthy that Phase (b) judges you at a single point of time unlike Phase (a), where you are judged over a period of time. Both the components have an equal weightage for the purpose of student evaluation. I strongly believe that the assessment should rely 80% on the former as the appraisal analysis is spread over some period of time. Following this approach would positively make the grading process more transparent and sensible. Unwittingly, it will also benefit MBA students who religiously follow our current grading system. Takeaway: Grades, according to me, are synonymous with a pat on the back for your good work. That’s why you crave them. Whether they reflect your actual performance to the corporate world outside of your B-School remains a matter of concern. 5 years into your job and they’ll hardly matter to anyone. Including you. Change that traditional frame-of-mind before entering a B-School. You’ll learn to enjoy and enjoy to learn much more! 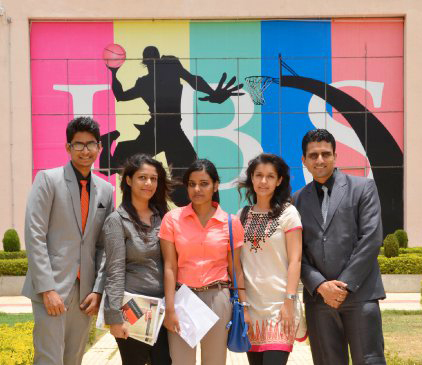 This entry was posted by Alumni Speak and tagged B-School, Management Course, MBA Program . Bookmark the permalink. It pays to be well prepared for the classes, particularly, when the method employed is Case-based learning. Good grades do not hurt at all. But what’s more important is that the process is followed zealously. I am mighty glad you liked the contents and agreed with the purpose of this Article. Thanks for the link. It was useful and informative.